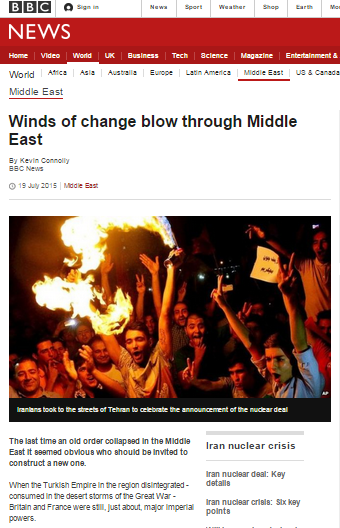 On July 19th an article by the BBC Jerusalem Bureau’s Kevin Connolly appeared in the ‘Features’ section of the BBC News website’s Middle East page under the title “Winds of change blow through Middle East“. Connolly’s basic premise is that the JCPOA signed by the P5+1 and Iran last week heralds a new era. “This was a week of change though. Once the US and Iran glared at each other across a chasm of values: where the Iranians saw themselves as champions of Shia communities and exporters of revolution the Americans saw only sponsorship of terrorism. That may now begin to change although we don’t know how far or how fast that change will go. “With the Turks defeated in Jerusalem and Damascus and Sinai and Gaza there was a new world to be made. Yes, the British government had produced the Balfour Declaration in 1917 but Connolly misleads readers by failing to clarify that the establishment of the Jewish national home was not merely based on a pre-existing British commitment but in fact had its foundations in the legally binding unanimous decision of the fifty-one member countries of the League of Nations in 1922, which Great Britain was charged with administering and which the United Nations reaffirmed in 1946. 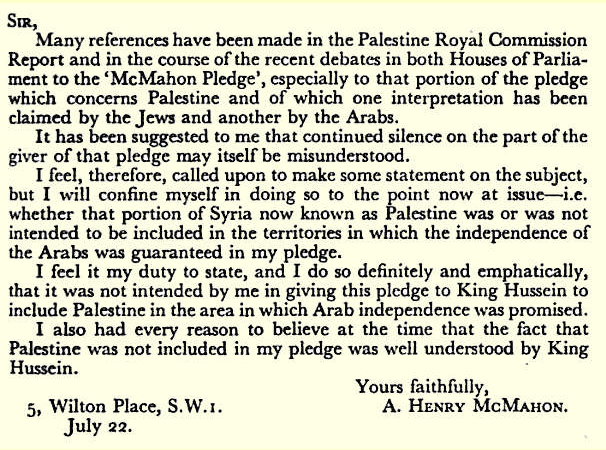 Connolly omits any mention of the fact that the Hussein-McMahon correspondence did not include Palestine, as Sir Henry McMahon himself pointed out in a letter to the Times in 1937. “But we got a feel for some of the forces that will shape the new order in Vienna this week when the world’s great powers – the UN Security Council plus Germany – struck a deal with Iran. The talks were convened of course to deal with Iran’s nuclear ambitions – and so they did. “Iran after all is the main force propping up the faltering Syria regime of Bashar al-Assad, and it is using Hezbollah, the militia it founded and funded in neighbouring Lebanon to bear the brunt of the fighting. Iranian-backed Shia militias have been fighting in Iraq against Sunni extremists – often filling vacuums left by the country’s armed forces. Hizballah, of course, is not merely an Iranian proxy “militia” as Connolly leads readers to believe: it is an organization with a long history of terrorist and criminal activity both in the Middle East and much further afield. But Connolly’s whitewashing of Iranian patronage of terrorist organisations does not end there: he fails to make any mention of the theocratic regime’s material and ideological support for other terror groups such as Hamas and the Palestinian Islamic Jihad. Moreover, the extremist religious ideologies which are the foundations of the Iranian regime itself and the reason behind its patronage of Shia and Sunni terrorist organisations are portrayed by Connolly in markedly muted terms. “Iran is the great power in the world of Shia Islam, just as Saudi Arabia would see itself as the leader of those who follow the Sunni tradition. In other words, a BBC Middle East correspondent who has been located in the region for over four and a half years would have audiences believe that hostilities rooted in religious doctrines may be (perhaps; he’s not quite decided) just around the corner. As long as Connolly and his colleagues continue to downplay Iranian sponsorship of terrorist groups motivated by religious ideology BBC audiences will obviously be unable to fully comprehend the reservations voiced by many in the Middle East concerning the “winds of change” bolstered by the terms of the JCPOA agreement or to fully understand the “international issues” likely to develop as a result.